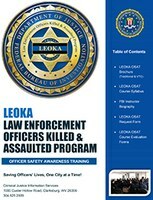 People may find it surprising to learn that felonious killings of officers each year most often occur during arrest situations.1 I did not know this until I joined the FBI’s Law Enforcement Officers Killed and Assaulted (LEOKA) Program after serving as a uniformed officer for 18 years. The numbers demonstrate how these officers were hurt or killed, but it is critically important to look behind the scenes and explore why these incidents happened. Understanding why can change officers’ mind-sets to better prepare them to avoid or survive potentially deadly encounters. Once offenders believe they face arrest, the risk increases that they will attack. Offenders do not have to explicitly hear they are under arrest; it simply could be their perception.6 They may perceive an arrest is imminent when an officer arrives at the crime scene, conducts a traffic stop, or interacts some other way. If officers believe every situation they encounter could result in an attack, it puts them in the right mind-set to prepare for or prevent an assault. Mr. Philip D. Wright, a retired West Virginia state trooper, is an officer safety awareness training instructor with the FBI’s LEOKA Program. In one study two-thirds of the offenders facing arrest were looking for an opportunity to assault or kill the officer.7 Because of findings like these, the LEOKA Program developed the Officer Safety Awareness Training (OSAT) course, offered to law enforcement personnel to train them in understanding why attacks occur. Throughout my travels across the United States leading OSAT courses, I have met officers from agencies of varying sizes and resources. While speaking with law enforcement personnel I have found that most of them say they received some type of training on arrest situations (e.g., defensive tactics, handcuffing) during the certification process to become police officers. Several of them have acknowledged that they participated in additional, updated, or more effective training. However, most of the officers also reported they do not handcuff according to their training. All officers train for arrest situations, yet these instances accounted for almost a quarter of officers feloniously killed over the past 10 years. Some attacks cannot be prevented despite the employment of proper procedures. However, I still wonder how often officers have deviated from areas of training, creating an opportunity for assault. As soon as officers decide to arrest someone, they must follow training procedures before, during, and after the arrest to prevent vulnerability. No singular profile exists of an individual who feloniously assaults or kills law enforcement officers.10 An arrest for a minor infraction of the law can result in an assault against an officer. During an unplanned encounter an officer often does not possess prior knowledge of the violator’s willingness to use force and violence.11 Officers must maintain the proper mind-set every time they put on the uniform. Understanding that every situation could result in an assault gives officers the upper hand. They owe it to their families and themselves to make every effort to return home safely after each tour of duty. Mr. Sheets can be contacted at james.sheets@ic.fbi.gov. Based on more than 40 years of research and data collection, the Law Enforcement Officers Killed and Assaulted (LEOKA) Program provides free Officer Safety Awareness Training (OSAT) to local, state, tribal, federal, and international law enforcement agencies. The goal of the LEOKA Program’s OSAT course is to provide relevant, high-quality, potentially lifesaving information to law enforcement agencies that focuses on “why” an incident occurred, as opposed to “what” occurred during the incident. Training does not address tactical issues. For more information or to request an OSAT course in your area, please access the link below or e-mail the training staff at leoka-training@leo.gov. 1 U.S. Department of Justice, Federal Bureau of Investigation, Criminal Justice Information Services Division, Law Enforcement Officers Killed and Assaulted, 2012, http://www.fbi.gov/about-us/cjis/ucr/leoka/2012 (accessed June 23, 2014). 3 A.J. Pinizzotto, E.F. Davis, and C.E. Miller III, U.S. Department of Justice, Federal Bureau of Investigation, In the Line of Fire: Violence Against Law Enforcement (Clarksburg, WV, 1997), 30. 4 A.J. Pinizzotto, E.F. Davis, and C.E. Miller III, U.S. Department of Justice, Federal Bureau of Investigation, Violent Encounters: A Study of Felonious Assaults on Our Nation’s Law Enforcement Officers (Clarksburg, WV, 2006), 25. 6 Pinizzotto, Miller, and Davis, In the Line of Fire, 37. 7 Pinizzotto, Miller, and Davis, In the Line of Fire, 30. 8 Pinizzotto, Miller, and Davis, Violent Encounters, 94. 10 Pinizzotto, Miller, and Davis, In the Line of Fire, 43.